On Wednesday, January 2, 2019, all Adams County Motor Vehicle offices began observing new office hours. Those hours are 8 a.m. - 4:30 p.m. for the general public and 8 a.m. - 4 p.m. for companies and dealers. After 4 p.m., only one transaction will be permitted per company/dealer. 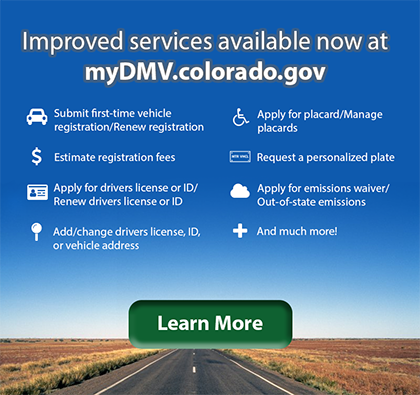 The Adams County Motor Vehicle office is committed to providing the most current information about vehicle licensing, registration, services, regulations and programs to its residents. For this reason, the following information relating to vehicles has been provided for your convenience. Click the image below for more information. *In office transactions accept cash, checks or Credit Cards. A transaction fee of $0.75 plus a 2.25% service charge is applied to all Credit Card transactions; this fee is passed on to our card merchant. See below for estimated wait times, map of locations, and contact information. Company and Dealer Desks are open from 8:00 a.m. – 4:00 p.m. Excluding Closure Dates. Click here for a list of closure dates. Click here for information on Dealer and Company Services. Best hours to visit are between: 8:30 - 11:00 a.m. and 2:00 - 4:00 p.m. Best days to visit are Tuesday, Wednesday, and Thursday. Best time of the month is the middle of the month.